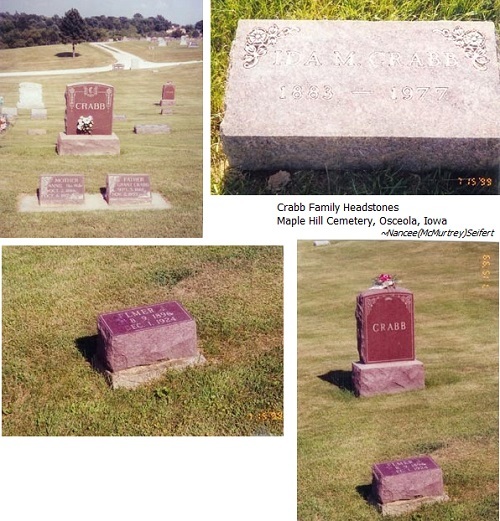 Elmer Jay Crabb, son of Grant and Annie Crabb, passed away at his home two and one-half miles southeast of Hopeville, Iowa, December 1, 1924, at the age of 28 years, 9 months and 6 days. He was born February 9, 1896 in Greene County, Iowa. 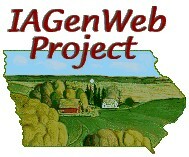 When a small child, he moved with his parents to Lacelle, Iowa where he grew to manhood. He was married to Pearl Weldon, April 18, 1914. To this union were born three children: Everett, aged nine, Arlene, aged seven, and Helen, aged two. Besides these he leaves to mourn his departure, his father, Grant Crabb, two sisters, Mrs. Jennie Moran, Mrs. Effie Davis and two brothers, Roy and Guy. His mother, Mrs. Annie Crabb and one brother, Willie, having preceded him in death. Other relatives, friends and neighbors are bereft in this sad departure. His illness was of long duration, being ill thirteen weeks. His suffering was at times intense, though he bore it all patiently, often expressing a hope of being spared for his family and to raise his little children. About two weeks before his death, he surrendered his heart to God and peace came to his soul. He told his loved ones he was now ready to go and asked them to meet him in Heaven. We feel assured that he is now resting in the arms of Jesus, and that the dear Christian mother's prayers have been answered and a dear son has gone to join her where pain and sorrow comes no more. He was a kind husband and loving father -- a good neighbor and always willing to help those in need. May the mourning ones be comforted in the hope that Jay lives on and prepare to meet him on the better shore, where parting will be no more and at last an unbroken family around the great white throne. So may God comfort the aching hearts and may his blessings rest upon each is the wish and prayer of the writer, Mrs. Lissa McCutchan, Grand River, Iowa. Funeral services were held from the Osceola Christian Church, Wednesday, December 3, 1924, Rev. C.E. Wilson officiating. Interment in Maple Hill Cemetery [Osceola].